CTAC's Business and Clinical Practices web-based training is a follow up to our first Outcome Measures Training. It is designed in response to feedback from CTAC participants from the first training about outcome measures and how to utilize them within a clinic setting. Outcome measures assess clinical effectiveness, such as behavioral, cognitive, and emotional functioning, and non-clinical results, such as perception of care. 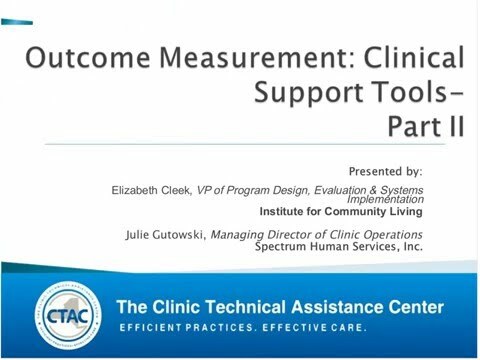 This webinar will offer more in-depth information around assessing client-specific factors, helping clinic management to understand best practices, and more 'How Tos' around the utilization of outcome measurement tools.